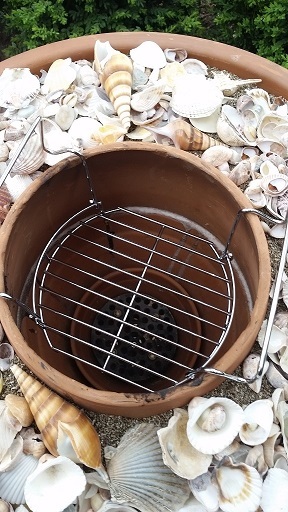 Here we have a very elegant looking Tandoor made by Mike, which you would always want to have on show. Now I am always being asked where can you get a tandoor grate for the bottom of my tandoor, and here we see two examples from Mike. 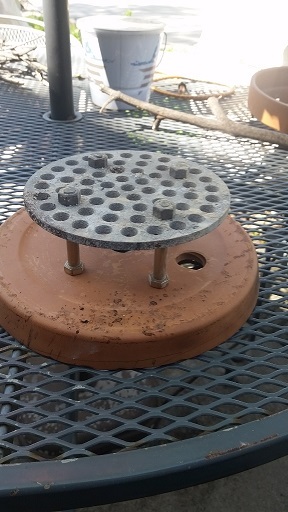 The bottom grate is a 6″ cast iron floor drain that he purchased on e-bay for $6.00. He used 4 – 2 1/2″ stainless steel bolts for legs to elevate it for better air flow. The cooking grate was purchased on Amazon for $13.50. 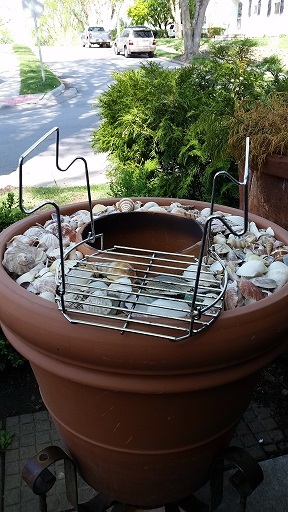 It is called a 9″ bunk bed basket for the Big Easy grill. Since the pictures were taken he has added wheels to the stand to make it more portable as it is pretty heavy. One of the big features of this oven is the beautiful stand that it rests on. This was an old end table he took the the glass top off and the large pot fits in it perfectly. 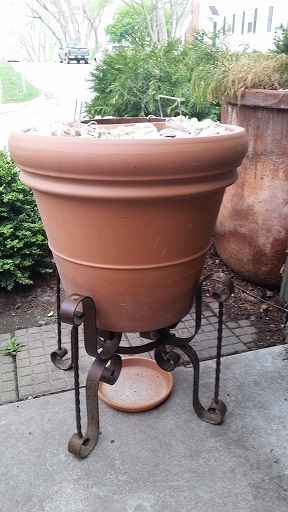 Finally I love the shells on top to stop the vermiculite blowing away. what size pot did you use for the outer? How do u clean the coal, is it easy?